Download Calpernia on “Gay Pimpin’ with Jonny McGovern” Podcast Today! Hey kids! 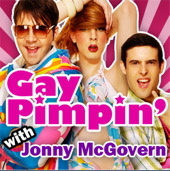 Be sure to tune in to the new June 23rd, 2009 “Gay Pimpin’ with Jonny McGovern” podcast, which should be available on iTunes this morning! (I’m at around the 1:10 mark) In this edition, I get to talk with “Jamie Lynn Spears” LIVE on-air! What a dream! Martâˆšâ‰ n and I battle tabloid rumors that threaten to destroy our platonic friendship, and I bond with Linda over our shared love of the cinema masterpiece known as “Jewel of the Nile”. I also update everyone on my upcoming trip to Grand Marshall in the San Francisco Pride Parade, and the newly available pre-orders for the feature-packed “Transproofed DVD”! BY THE WAY! at the 1:31:21 it sounds exactly like I say “Sh!tting”, but actually I was saying “shooting”! SHOOTING!